Criffin was born out of dreams and passion, with the goal of building a bridge for everyone who is ready to take a step beyond reality. Established in 2012, Criffin has researched the field of Virtual Reality, examining multiple aspects of this new technology and how we can interact with it, in the most natural way possible. Maximising usability and minimizing learning curves has been our highest priority in order to ensure that we can deliver the best possible user experience within this new medium. We believe in a portfolio approach to our technology. Focusing on the needs of businesses and industrial use cases, we understand that every solution requires some custom tailoring to allow it to fully suit the needs of the client. We have developed one of the most robust methods of locomotion within VR, and specialize in full-body motion capture to provide body presence in what is normally a disembodied experience. As we continue to grow, our focus will remain on developing tools, products and technologies to further enhance our ability to dissolve the barriers between the real and virtual worlds. Criffin has always valued scientific approach and therefore developed ties with scientific companies. Virtual Neuroscience Lab – a scientific unit researching VR was founded by Madis Vasser and co-founded by Criffin’s founder, Peeter Nieler. In the end of 2017 Virtual Neuroscience Lab was a merged with Criffin by capturing valuable research results and know how needed for further research and development in Criffin. Virtual Neuroscience Lab has conducted interesting smaller and bigger research projects related to Virtual Reality that can be seen further down on this page. NeuroSc Lab was stongly focused on the research of neurohaptics or what we also call “tactile illusion study” and Criffin is currently looking for academic or private sector science partner for continuing Neurohaptics studies. 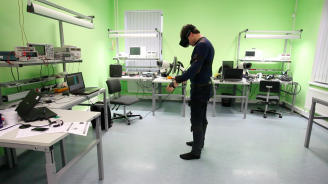 Additionally to our Human Interaction Design Lab (HID Lab in short) we are very close with virtual reality laboratory founded in Tallinn University of Technology and looking into joint research with University of California. Besides number of smaller studies we have built Limelight VR with former Virtual NeuroSc Lab. With partners from private and public sectors we have started to research several important subjects for Virtual Reality such as “Neurohaptics” and “Dynamic Model based Visualization of Complex Processes in Virtual Reality”. Both research subjects are important, please read more detailed information in below. We develop our technologies based on scientific approach testing on number of subjects. Our systems can be integrated to all major game engines with ease. Five years in the field of Virtual Reality gives us strong competitive edge. Pushing the limits is in our nature. Criffin’s tools are ahead of competition.